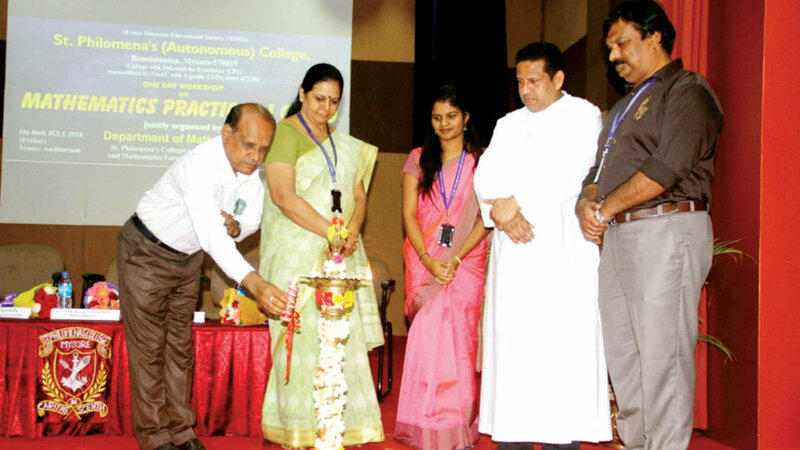 Mysuru: The Department of Mathematics, St. Philomena’s college and Mathematics Forum, University of Mysore, jointly organised a one-day workshop on Mathematics Practical-1(CBCS) under Choice Based Credit System (CBCS) recently. In her inaugural address, Dr. Ruth Shantha Kumari, Principal of St. Philomena’s College highlighted the importance of practical applications of Mathematics in day to day life. The Rector of the college Dr. Fr. Bernard Prakash Barnis, in his presidential address spoke about importance of practical approach of the subject which helps the students to work in various fields. Prof. Mayigowda, Principal, Bharathi College and President of the Mathematics Forum, University of Mysore, said that the teachers should teach the subject from grassroot level with practical approach to the subject. Dr. Guruprasad, Assistant Professor, was the resource person. Convenor V. Sanjay Nair welcomed. Shruthi Menezes, Assistant Professor and Organising Secretary, proposed a vote of thanks.